Tossing a beanbag to knock down a pyramid of cans is a classic and fun game of skill. It's a great way to develop motor coordination and accurate throwing for anyone from the youngest toddler on up to adults -- just set the distance the player has to stand away from the cans to change the difficulty. You can also allow a player three tosses or just one. Use the numbers on the back of each can a player knocks down to total up the score in each "round" of the game. so the game is safe for furniture as long as nothing too fragile is in the way. And indoors or out, kids will love the satisfying tinkling crash the cans make when they're knocked down. Kids will also love the cute and silly faces painted on the cans. Each one of the 10 cans has a different face, expressing all sorts of funny emotions. There are also numbers on the back of each can to use when totaling the score for each player's throw. Just set up the cans so that #1 is at the top of the pyramid, then #2 and #3, and so on. Order today for a fun and challenging game that's sure to be a hit with any group of children! This iBaseToy product is sold with a full money-back guarantee. If you're dissatisfied with the bean bag toss game for any reason, contact us for a replacement or refund. A FUN AND SIMPLE GAME FOR TODDLER AGE ON UP. Set up the cans in a pyramid, then toss the beanbag to try to knock them down. Whoever knocks down the most cans wins! CUTE PAINTED FACES ADD TO THE FUN. 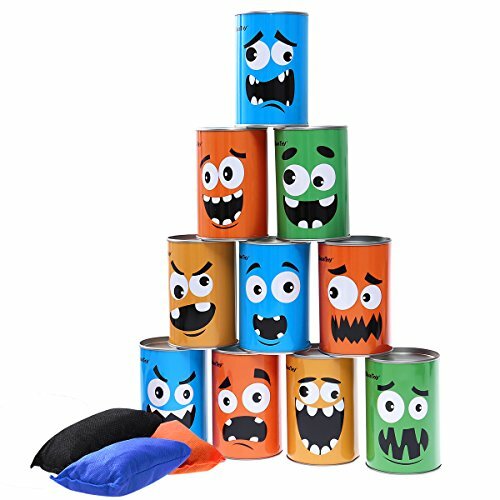 Kids will love the silly faces on the cans. Each one of the 10 colorful cans has a different face, and on the back there are numbers for scoring. QUALITY CANS AND BEANBAGS. The cans are made of sturdy metal, and the beanbags are filled with fabric so they aren't too heavy. The bean bag toss game can be played indoors or out. NOISY AND HARMLESS. Youngsters always enjoy opportunities to make some noise, and These lightweight cans make a satisfying crash and clatter when they're knocked down. NO-RISK PURCHASE! UNCONDITIONAL MONEY-BACK GUARANTEE. If you're unsatisfied with this carnival game for any reason, we'll immediately refund your purchase price. If you have any questions about this product by iBaseToy, contact us by completing and submitting the form below. If you are looking for a specif part number, please include it with your message.